Yikes! The holidays are here! I can’t think of anything better than starting off the holidays with Thanksgiving. We really should start celebrating Thanksgiving more often— and no, not just for the food:) It’s important to be grateful for what we have, especially the little daily things. Like a dishwasher for instance. Who else is sick of doing the dishes?! [Me! Me!] BUT I have to remember there has been a time in my life when I didn’t have a dishwasher. Ugh. Not a fun one to remember. So, ultimately I am very grateful for a dishwasher, even if it comes with doing. the. dishes. I feel like sometimes it’s so easy to get over-taken with the “MORE” disease…. please don’t tell me I’m the only one! So when Thanksgiving is here I like to find ways to get my family to remember things we are thankful for. We write down things we think of at the end of each day– some years we have added feathers to a turkey, a link to a chain, or a leaf on a branch. Since I am on a treasure hunt kick we will have my “I AM THANKFUL” Service Treasure Hunt to start us off this year. I was actually quite interested to see how the kids would react to this kind of treasure hunt…..errr… I should really say, cleaning the house! 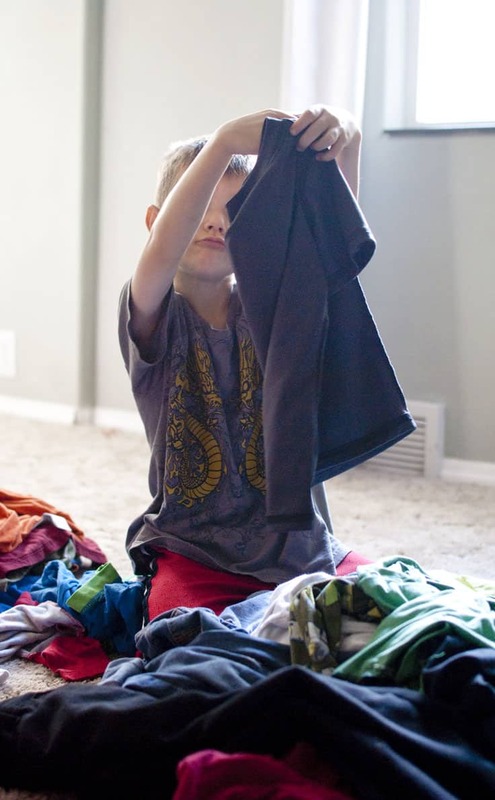 There’s nothing better than tricking them into chores, right?! Muahahahaha! You can start your SERVICE TREASURE HUNT wherever you’d like. Since we were doing a special family lesson about Thanksgiving and showing gratitude, I just gave it to them when we were finished (and because they couldn’t sit still any longer). I would suggest to do this hunt on a day you have been busy and haven’t had a chance to pick up the house. Make sure the dishwasher isn’t unloaded, the floors aren’t picked up, the beds aren’t made, the garbage is full, and the laundry isn’t folded! It took until about clue #2 before my oldest (9yrs) was no longer fooled by the “chore” thing. I may or may not have heard her say, “Let’s just get this done so we can get our prize!” So sweet, right?! She toughed it out and was a good sport, though! My younger two didn’t really seem to mind too much. I think the main thing was that most of treasure hunts we have done go really fast–they run around, being wild and crazy, racing from point to point and end up with some sort of prize. But this treasure hunt takes a little more time. So I liked that they had to be a bit more patient and I made sure they did a good job with their tasks. I LOVE my ending for this treasure hunt. I really wanted to show how grateful I was for my kids. After all, I had just “tricked” them into chores:) They were so great to chip in helping out around the house and I just wanted to say that I am thankful for THEM. They really do light up my days and constantly make me laugh and smile. Life would be very bland without them! I could have made treats or given them candy bars for the ending, but I went with a simple gift for each of them from the Dollar Tree. And it was perfect; a magic kit, some silly putty and a ninja turtle fuzzy poster with a couple pixie sticks. It was a hit! I ended the treasure hunt to hide their prize in their “special spot”. All of my kids have a treasure box that they love, so I put it in there. It was fun watching them figure out where I thought their “special spot” was! Alright, now it’s time to get those little hands cleaning! 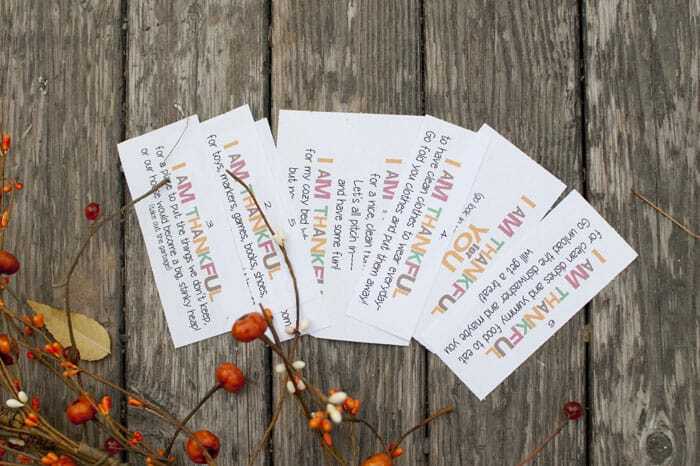 I am also adding an “I AM THANKFUL for YOU” printable for your treasure hunt…. or for anything else that may spark your creative juices! Enjoy!